MTC stands for Machine Type Communication. This is mainly designed to use LTE for M2M (Machine to Machine) or IoT (Internet of Things). Usually these application requires not that much throughput (in most case it needs very low throughput). Why do you need this kind of special technique ? Does this mean that current LTE cannot achieve such a low throughput ? Of course there is no problem with the current LTE to work for such a low throughput application. But the issue is not with the low throughput, but with some other constraints. In practical point of view, this kind of application would need following characterstics. As I said there is no problem with achieving Low Throughput with the current LTE implementation, but there would be limitation to achieve Low Cost, Low Energy Consumption as required in this area (Actually Low Throughput itself is not a goal of the design. It is more like a result of design/implementation that meets MTC criteria illustrated below. Then how to achieve these critical requirement. The easies way we can think of is to reduce the complexity of LTE and this is the main motivation of MTC and it is one of major topics in Rel 13. I think this would be more important feature/topic in 5G than in 4G (Current LTE). Only in terms of throughput in a good signal condition, you may say like it. But with BW 1.4 and single antenna, it is very difficult to apply techniques to improve the reliable data connection (e.g, Spatial Diversity, Frequency Diversity etc). So we may need to change some specification to compensate this restriction. Also, we may need to change some lower layer specification due to item iii) as well. As of now (Apr 2015), no TS document yet, but you can get pretty details information from following documents. 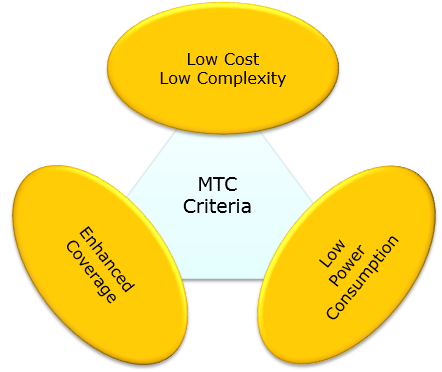 Now (as of Rel 13) we can see the real implementation of these criteria because LTE MTC specification is released. See how these general criteria turns into reality in LTE : LTE BL/CE (M1) and LTE NB pages.